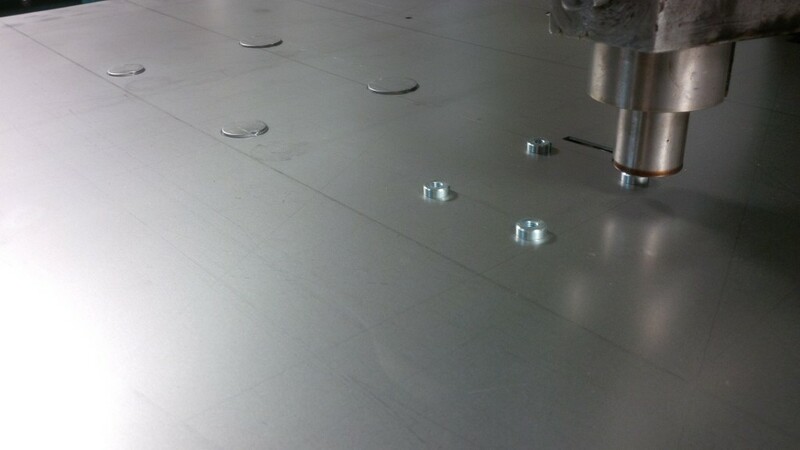 I always like it when a laser cutting or CNC punching nest completely fills a sheet of metal. This laser cutting nest of 0.7mm zintec lighting gear trays was just such a job. Being able to get the most from a sheet of metal helps to keep the costs down for our customers and speeds up production with less handling time. The middle image above shows this really well and the other two detail some of the features that were so easily laser cut. After several small batches of samples and development work this was the first production batch of 100 parts. If the volumes increase to many hundreds per batch then I may well look to move this job to one of our Trumpf CNC punch presses to increase the speed that the holes are processed but at the moment the Trumpf fibre laser is perfect for this job. Being able to move jobs between different production methods is a useful way of saving our customers money and time when a particular machine is busy. 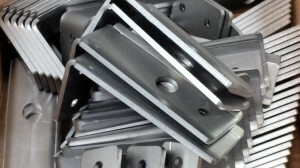 Here we are at the end of April and here’s another couple of sheet metal components that we have made this month. 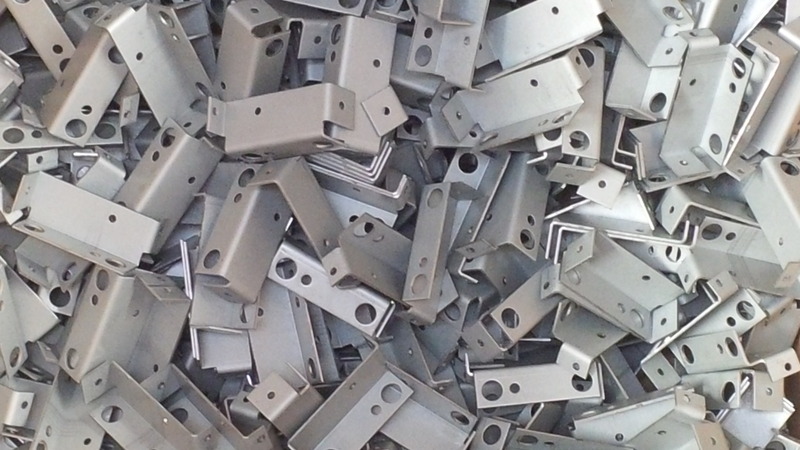 They are typical of the sheet metal components we make on a daily basis for our UK and European customers and they were each made in batches of several hundred. 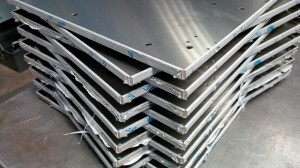 The components have been CNC punched and bent up from zintec coated mild steel sheet metal. If you click on the image you can see 3 holes in the middle of the component that have a plunged form and are used with self tapping screws. 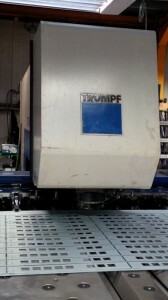 We have the tooling for M3, M4 and M5 as standard in our Trumpf CNC punch presses. Once we had finished them they were used to hold control gear for industrial light fittings and were just left self colour zintec as this was good enough for the warm dry environment into which they were going. 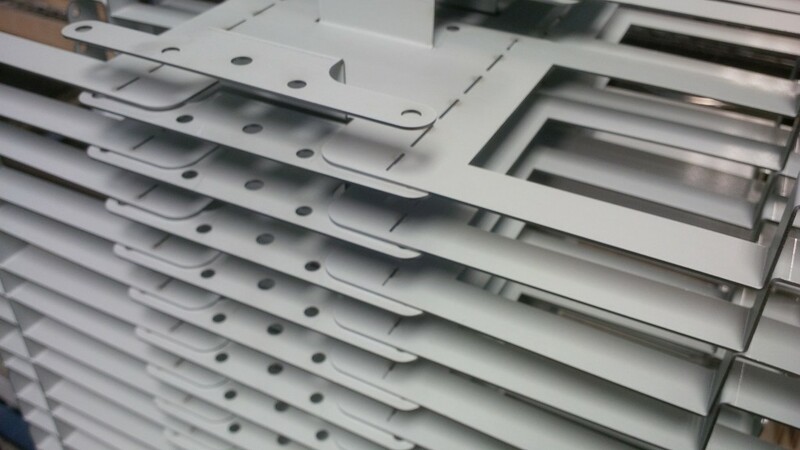 These brackets were laser cut and then CNC folded on one of our CNC press brakes. They were also made from zintec sheet metal and are used by a pump control company to hold a pumping system in place where beer is pumped from the kegs to the bar in public house cellars. Here are two recent folded sheet metal work projects I have chosen at random to demonstrate the versatility of sheet metal. These stainless steel brackets have been laser cut with the fibre plastic protective film in place and then folded again on our Trumpf 7036 CNC press brakes. These brackets were made in a batch of 30 parts and are made perhaps twice a year. Both CNC bend programs along with the CNC punching and laser cutting programs are stored on our company server and are available to the machine setters as all the CNC machines are on our company network. This leads to quick retrieval of past programs and storage of updates for any person who needs to access them. 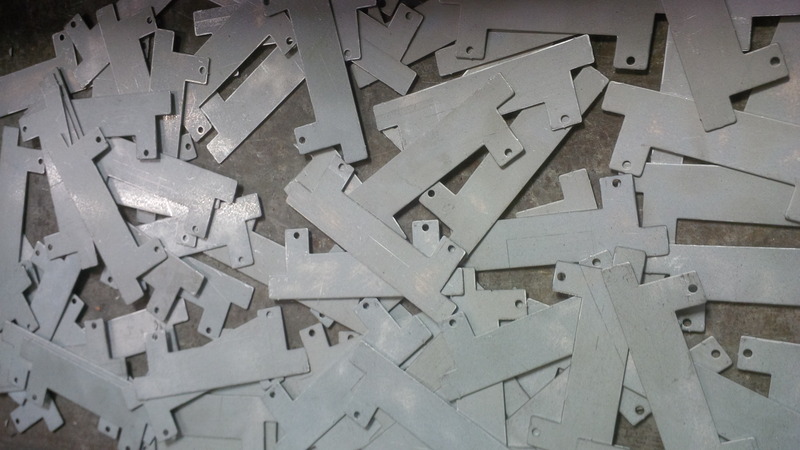 These 1.2mm thick aluminium brackets have been CNC punched and folded up on one of our Trumpf 7036 CNC press brakes. 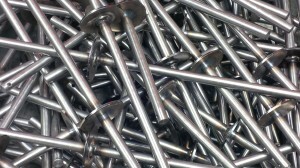 The batch size was 250 parts and they were a repeat order which we make several times a year. 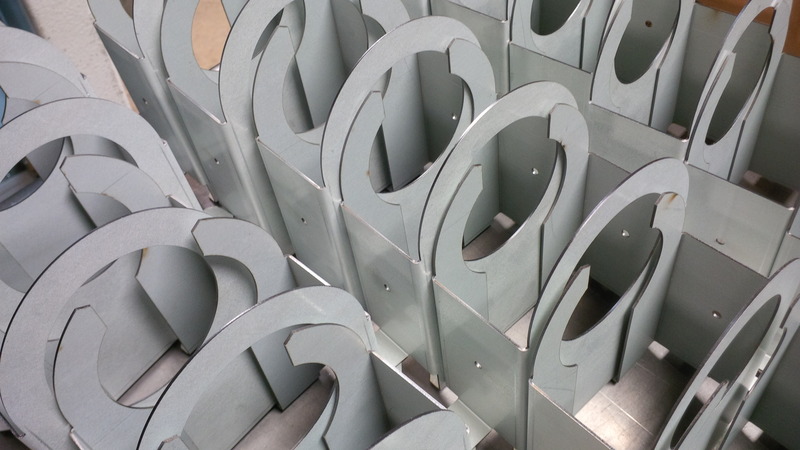 We can manufacture virtually any type of sheet metal brackets in mild steel, galvanised steel, zintec, aluminium, stainless steel, aluminium alloys, copper, brass or pre-painted materials. 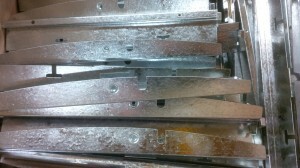 For more examples of sheet metal brackets please take a look at our gallery. 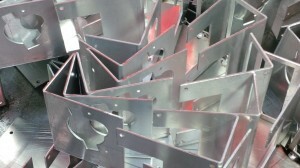 Please give us a try and we will be happy to quote for your folded sheet metal work needs. Having a fibre laser cutter has been a great advantage to us when it’s come to cutting out blank shapes from copper sheet. These simple triangle shapes could have been CNC punched but we would have wasted more material, we would have had to edge de-burr all the shaped to remove the CNC punch marks and the process would have been a lot slower. The Trumpf 3030 fibre laser cutter cut the parts straight out without any edge de-burring and used all the sheet here possible to get the best fit of components. 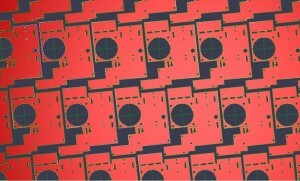 The pattern of copper triangles was arranged by using our Radan CAD/CAM software with it’s schedule module. It enabled us to mix several different shapes and sizes of copper parts together all laser cut from the same thickness sheet to save material and money across the whole project. Whenever we are working with expensive materials like copper sheet we try all possible solutions to get the best material yield when quoting for the work and then actually laser cutting it. If you have a sheet metal project in copper or brass and you have been told it can’t be laser cut, look again, up to 6mm thick and we can laser cut it for you. Our new Safan e-Brake 3M CNC press brake is more than capable of bending these large stainless steel roofing trays with it’s 100 Ton bend press force. 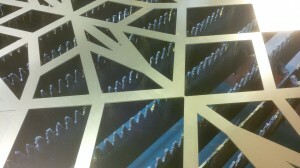 These 1.5mm stainless steel trays were laser cut from 3M x 1.5M sheets with only one coming from each sheet. They were then bent up on the press brake before finally having each corner joint seam welded to produce a water tight roofing tray for living roof systems. As well as folding large stainless trays such as these show here you can find us on most days folding zintec profiles, aluminium boxes, stainless steel brackets, pre-painted gear trays or mild steel enclosures. The Safan e-Brake is such a versatile machine for bending sub-contract sheet metal work that it was definitely the right machine for us. The tooling system with the Safan is very flexible, it’s show here with swan neck tooling ready to fold the deep stainless trays shown above. 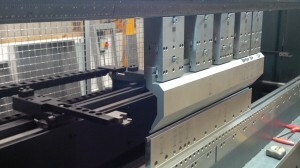 It allows us to share tooling with our 2 Trumpf 7036 CNC press brakes across it’s 3M long bed. By using extension adaptors we can fold very deep sections, trays, boxes etc. as well as safe edge, standard V bends and tight sections using swan neck tooling. 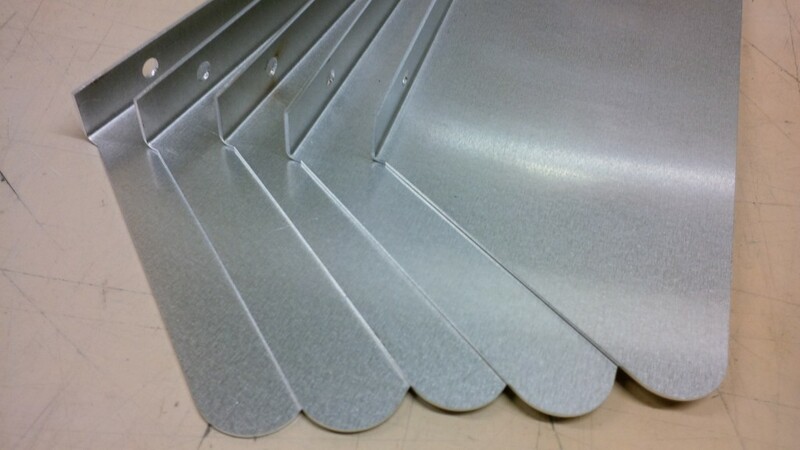 If you have a sheet metal project that needs bending, the chances are we will have standard tooling at no cost to yourself that we can use to produce your parts. Why not send us your drawings and we will be happy to take a look and produce some prices for manufacturing. 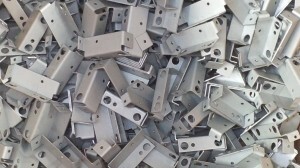 Small sheet metal brackets are a typical component for V and F Sheet Metal to manufacture. 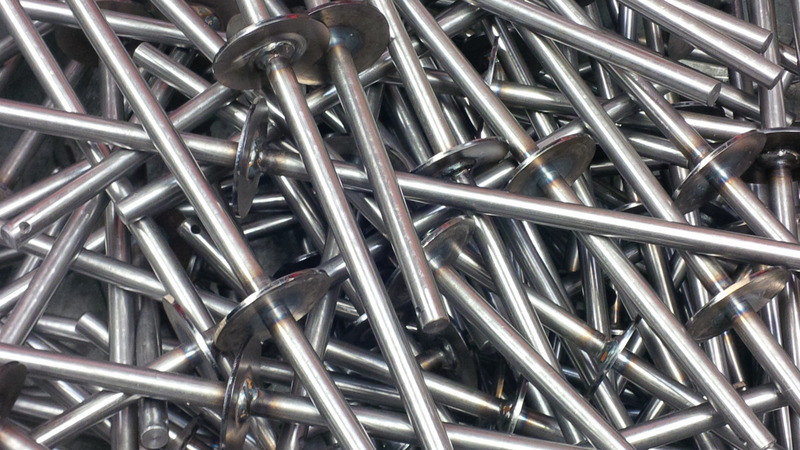 We regularly make just a few small brackets for a special project or repeating batches of many hundreds. Some of our sheet metal projects can be for many thousands of small bracket either CNC punched, laser cut of with dedicated tooling. 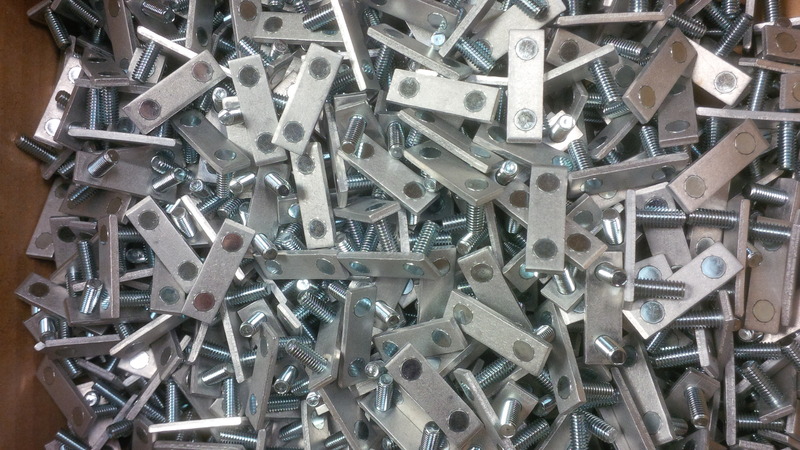 These particular small brackets were CNC punched and CNC bent using our Trumpf sheet metal manufacturing equipment. 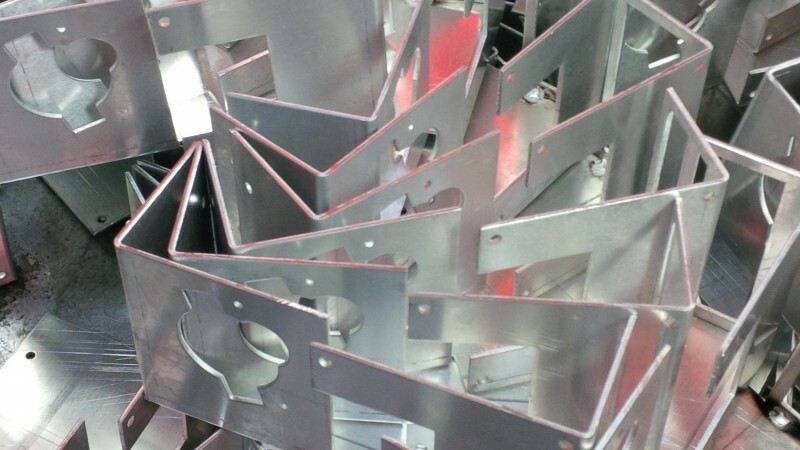 If you are looking to have small sheet metal brackets manufactured to your own designs then please give us a call on 01489 577786 or send us an e-mail with your drawings and we will be happy to help you with price options, design ideas and production. If you are looking for a KanBan call off that can be organised as well to suit your volume needs. When you want images, numbers, letters or symbols stamped into sheet metal that are permanent there’s no better way than using a CNC punch press. We have 2 CNC punch presses and both can take the same tooling enabling us to be flexible when it comes to production. These earth symbols have been CNC punched using a customer made punch tool and are clear even after zinc plating. If numbers or letters are needed there are several tooling options which can be used such as alphanumeric holders for part numbers and stock codes. Larger images can be stamped in one hit but the clarity depends on the material and needs careful design and advise from the tool makers. I would always say it’s worth asking us if you have an idea that needs stamping into a sheet metal product and you are not sure because we are always happy to check the feasibility with the tool makers for you before you need to commit to any tooling costs. 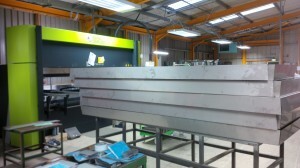 We had a project to produce stainless steel drainage trays for a customer of ours who makes living roofs. The type of roofs that have grass and plants growing across them on schools, bus shelters, nature hides etc. The roofing systems have a series of stainless steel trays laid over the roof with the plants growing and a drainage system to take the water away. The trays have welded corners and a simple gutter / down pipe system to take the rain water away. Inside each roof tray there is a filter system consisting of this stainless steel grid which is welded in place around a drainage hole allowing a filter media to be positioned to hold back the growing media. 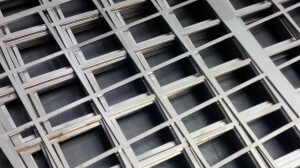 The stainless steel grid was laser cut from the same parent sheet as the drainage trays and designed to fit perfectly with small tabs that located into slots in the tray to aid positioning when being welded. We even left more material when we had to bend the grids so there was enough stainless to bend cleanly, this is the advantage of using a laser cutting machine even on small volume projects. Here we have 3 quite varied examples of sheet metal work manufactured in our modern factory. They show perfectly the flexibility of production equipment we have when producing batch sheet metal work for our customers. 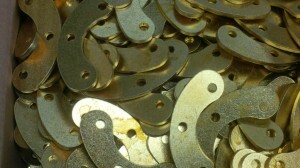 One of the more unusual materials that we work with from time to time is CZ108 brass sheet. We could have CNC punched these parts but with the complex arrangement of curves, several special shaped punch tools would have been needed which the 250 off batch didn’t really support. 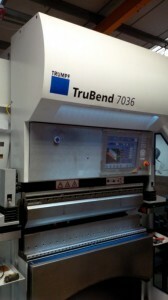 Luckily having a Trumpf fibre laser machine cutting brass up to 6mm thick isn’t a problem for us. These parts were laser cut straight from the sheet with the holes and external profiles programmed with our Radan sheet metal software. A quick barrel de-burr and the parts were ready for our customer. Here we have a batch of circular discs that have been CNC punched out from 3mm thick 5251 aluminium alloy. 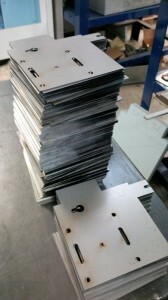 All the holes and internal cut-outs were produced with standard CNC punch tooling on our Trumpf 3000R CNC punch press. The outer circular profile was produced on the same machine as the last punching operation with a curved “banana” punch and die allowing the finished part to fall from the parent sheet of metal and into a collecting bin under the machine. 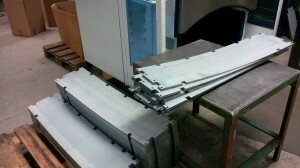 A quick edge de-burring operation and they were ready for powder coating. A more standard production job for us here at V&F is producing sheet metal work whether laser cut or CNC punched from galvanised steel sheet metal. These light fitting parts have been CNC punched, edge de-burred, CNC bent up and have a hank bush inserted. For more free advice and prices on your specific sheet metal projects please don’t hesitate to contact us on 01489 577786 or send us your drawings or 3D CAD data to sales@vandf.co.uk and we will be happy to help you more you sheet metal projects forward. Nice range of simple aluminium electronic front panels for professional audio equipment. With the large range of CNC punch tooling we have here most shapes and sizes of cut-out can be catered for without the need to purchase special CNC tooling. We have a list of all the CNC punch press tooling that you can specify when creating a new sheet metal design to make it easy for you to save money. If you are not sure you only have to call us and we will be happy to advise you on the best set of tooling to do the job. These front panels were CNC punched and had all external punched edges de-burred before they were wet spray painted and shipped. 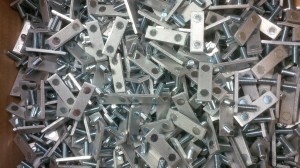 Sets of similar parts were all CNC punched on the same sheets to save material costs and keep the parts together in production. Small aluminium clamping bars used in electronics equipment. These sheet metal bars were CNC punched on our Trumpf 200 CNC punch press using standard tooling. 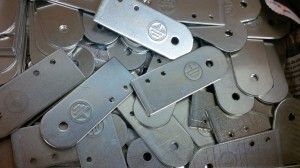 The parts were punched down through a die and collected from the machine with no corner holding tags. The parts were then barrel de-burred to remove all the sharp edges and finally, using our Haeger inserter, had their flush head studs pressed in place. The Haeger inserter can also be used to insert hank bushes, self clinch nuts, tank bushes, stand-offs and special purpose fasteners. A simple 0.7mm thick zintec coated mild steel bracket blank produced on one of our CNC punch presses. 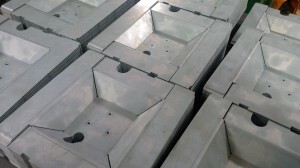 The radiused corners being produce with our R2, R3, R4 and R5 combination punch tool. 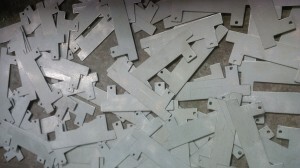 These parts are typical of the small sheet metal work that we CNC punch out all the time here at V and F Sheet Metal. If we don’t have quite the right tooling on the rack we can always look to laser cut the parts, so between both manufacturing processes we can cover all your sheet metal blank needs in ferrous and non-ferrous materials. If you are looking for a supplier of sheet metal work then please give us a call on 01489 577786 or send your drawings to sales@vandf.co.uk and we will be happy to review them and produce some prices for manufacturing. We are really pleased to have been chosen by Radan to be featured in a case study on the use of their software. We have been using Radan CAD/CAM software for over 16 years to help us produce sheet metal work from a range of machines. We use Radan software to produce 3D models from scratch and to read 3D models sent to us by our customers. We also use it to develop our 2D flat blanks which can be either CNC punched or laser cut with our Trumpf manufacturing equipment ready to be bent using a range of CNC press brakes. We have always valued the support we get from the Radan team and the continual development in the software to support a range of new features in sheet metal manufacturing machines. Please follow the link to our Radan case study for more detail. Great example of simple mild steel channel brackets that have been CNC punched and then CNC bent using one of our Trumpf 7036 CNC press brakes. These sheet metal projects are typical of the folded work that we are involved with everyday of the week for our UK customer base. Many parts that we fold up have to meet tight tolerances, such as +/- 0.2mm and we can achieve that in thin gauges due to the accuracy of the blanks we can produce via CNC punching and laser cutting as well as the high quality CNC folding facilities we have within our company. 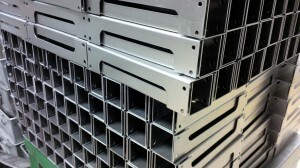 CNC punched and CNC bent aluminium chassis trays are no problem for us. We have a range of standard CNC punch tooling that enables us to produce your electronics holes, cut-outs and profiles without the need for new tooling in the vast majority of cases. These chassis trays were produced with a protective plastic film on the outside and then treated with an Iridite NCP finish before sending to our customer. 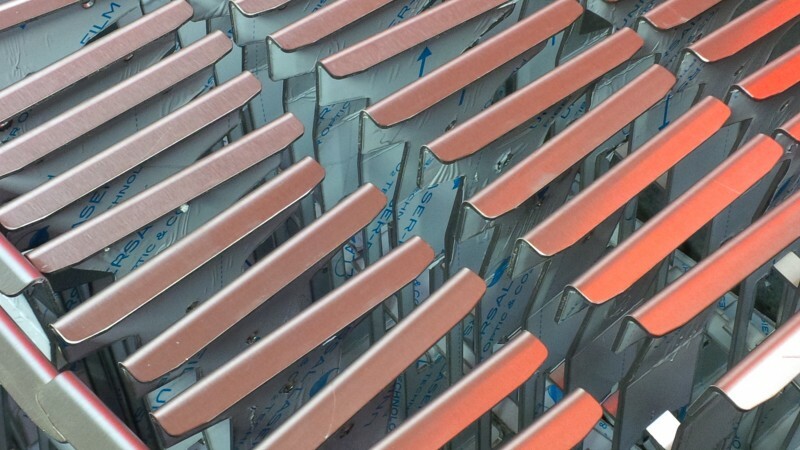 We are often asked to finish a sheet metal project be it powder coating, wet spray painting, anodising and Iriditing aluminium or zinc plating mild steel. We have a network of suppliers who can provide these finishes and offer design help for more complex parts to ensure there aren’t any problems when being treated. These mild steel brackets were laser cut, folded on our Trumpf 7036 CNC press brake and formed with simple tooling we made up to go on our fly-presses. They show nicely the range of manufacturing techniques that can go into the simplest of sheet metal parts. For more information on the range of bending / folding options we can offer you from the smallest stainless steel spring clip to 3M long folded sheet metal sections. Have a sheet metal work project that needs folding, please give us a call or send your drawings to sales@vandf.co.uk and we can offer you free advice if needed and quote options to see what will work best for you. It’s not often that we get a laser cutting job that can really show off the ability of our Trumpf 3030 fibre laser cutting machine here at V and F Sheet Metal but here is one such sheet metal project. 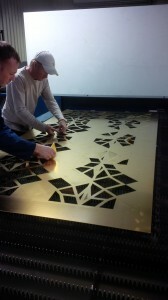 We were asked to cut 2 decorative brass fretwork panels and our laser cutting machine was perfect for the task. The brass panels were to be manufactured from 2.5mm thick brass sheet and laser cutting was no problem for us having a fibre rather than CO2 laser cutting machine. 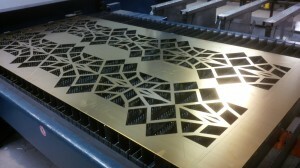 The Trumpf fibre laser cutter is able to cut up to 6mm thick brass sheet so this order was no problem. I took the DXF files supplied by the customer and cleaned them up. They had various errors in them including lines upon lines, corners not joining in places and more importantly points where if we had followed the drawing the brass panel would have fallen into several parts. All the drawing was cleaned up using our Radan CAD/CAM sheet metal software and small changes were made to suit laser cutting. 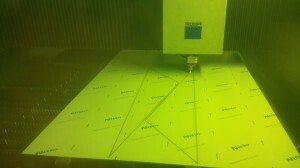 The “clean” file was then programmed for laser cutting and the 2 panels needed laid out on a single 2500mm x 1250mm sheet. With both parts laser cut and the sheet automatically cleared from the machine it was only left for us to remove the internal waste parts to reveal the finished brass fretwork panels. Perhaps you have a brass sheet metal part that you didn’t realise could be laser cut with modern fibre laser technology, please give us a call on 01489 577786 or send us your drawings to sales@vandf.co.uk and we will be happy to help you and advise where you designs can be improved to save you money. Our Safan e-Brake CNC press brake is more than capable of folding sheet metal work up to 3M long and with 100 tons of electric motive force you can see that these sheet metal housings were no problem. With each sheet metal housing having 8 full 90 degree bends to complete the enclosure to hold the electrical components for an emergency exit light. 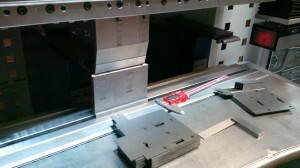 The order was for 500 housings and the blanks were produced on our Trumpf 200 CNC punch press to ensure they were precise and would produce an accurate component throughout the batch. The Safan e-Brake is fast, very quiet to operate and easy to program, making it the perfect machine for light sheet metal work batch production such as this. 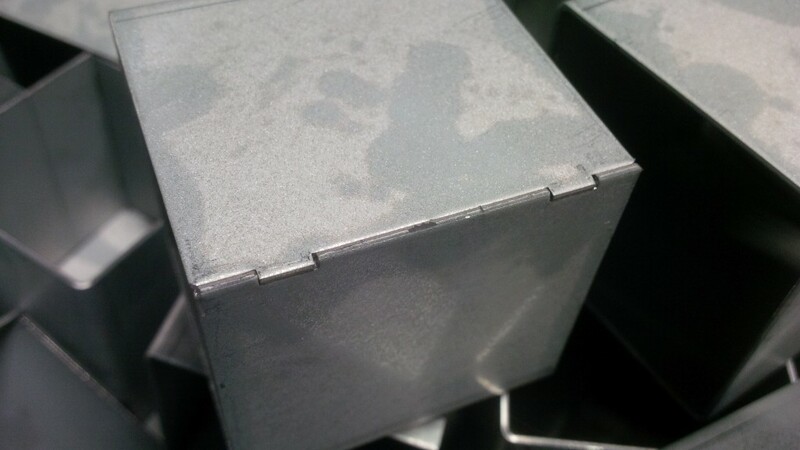 Sheet metal housings such as these are our bread and butter and we are often found manufacturing sheet metal housings from special projects to repeating batches of 25 and 50 up to 500 like this and beyond when needed. Have a sheet metal housing and need a price, please don’t hesitate our engineering team and we will be happy to help you. Here’s a small cross section of sheet metal work that we have produced in February 2016. Having such a wide range of customers in many different industry sectors allows us to gain a vast range of experience in manufacturing in different materials, thicknesses and sizes. From small clips and bent angles, painted front panels, anodised rear panels, zinc plated brackets, zintec folded sections, welded sheet metal fabricated assemblies we can deal with it for you here in our manufacturing site at Fareham, Hampshire. 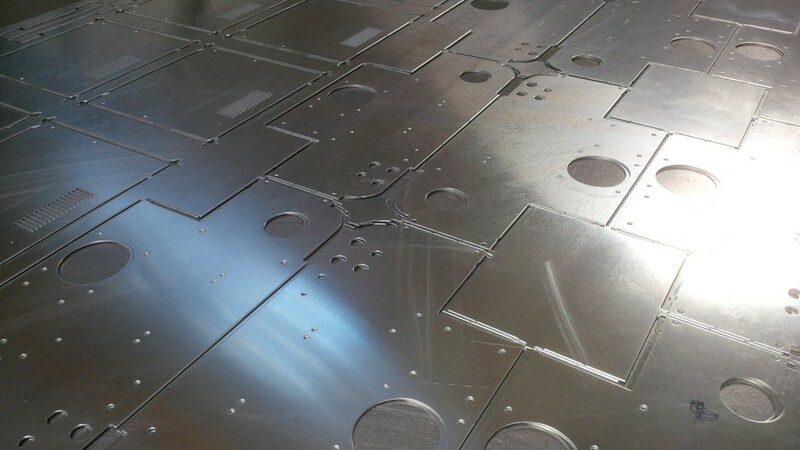 What is sheet metal work and how is it made?, take a look at the link and we fully explain how we go about manufacturing your sheet metal work in a modern CNC controlled environment. I happened to be walking past our laser machine when the access doors were open and I took the chance to get this nice image of a full sheet of laser cut parts. The sheet of mild steel is full of the same components nested together to make the most efficient use of the material, click on the image and you will see what I mean. This “true shape” nesting is achieved automatically with our Radan CAD/CAM software which not only saves us material but can be used to trial different programs at the estimating stage before an order is placed to get the best possible price. These parts were all cut with oxygen and once they had been folded up they were zinc plated which moves all signs of any laser cutting on the surface of the sheet metal. The oxygen cut in this thin gauge produces a perfect finish without the need to do any edge de-burring operations. If you have a ferrous or non-ferrous sheet metal project that needs laser cutting please give us a call or send us your drawings to sales@vandf.co.uk and we will be pleased to quote you. 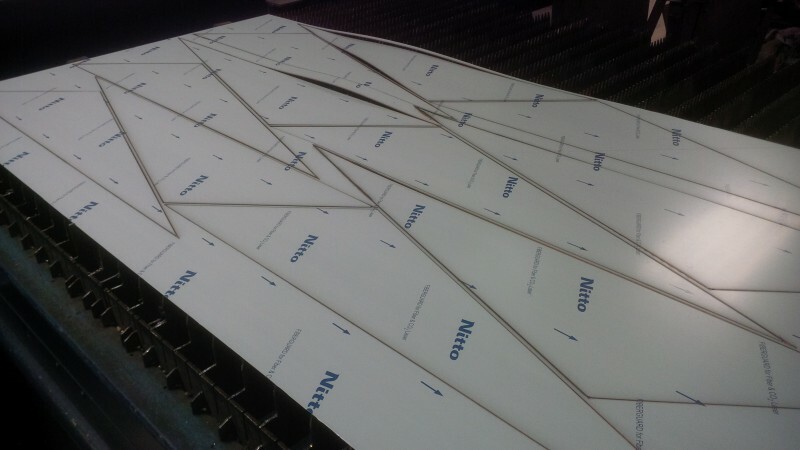 Before we can fold any sheet metal work we need to produce a developed blank shape. This blank has to be the correct size so that when it’s folded up it becomes the size and shape required for the customer’s drawn design. Using our Radan CAD/CAM sheet metal software we are able to simulate the component as a 3D model and then unfold the part to create the correct blank ready for folding on one of our CNC press brakes. The blanks can be CNC punched or CNC laser cut, these brackets have been laser cut using our Trumpf 3030 3KW fibre laser, a brand new machine installed in 2013 to boost the blank production capacity along side our 2 CNC punch presses. The accuracy of the blank is essential in achieving an accurately folded sheet metal bracket and the laser certainly gives us this accuracy and control over the profile finish. Here are the components before they have been folded up and after. The brackets are relatively simple with just 4 x 90 degree bends which have all been created with the same V block and blade tooling. 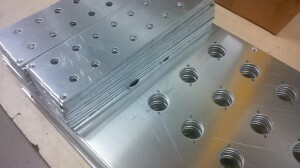 The CNC program to fold up the brackets has been written at the machine and then saved away onto our company computer network for recall at a later stage if the components are manufactured again. The folding process is relatively simple using the same tooling and simply folding one bend and turning the component over and then bending again to create the Z shapes seen in the photograph. 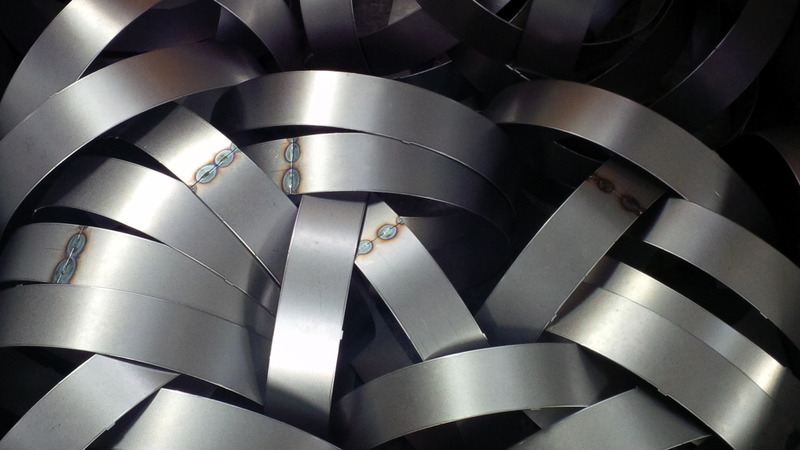 And the final folded brackets stacked ready to be packed up and sent off to the zinc platers for treatment. These folded sheet metal brackets are typical of the smaller parts we often manufacture here at V and F Sheet Metal on our Trumpf 7036 CNC press brakes. If you have a sheet metal design that needs folding up be it 0.7mm mild steel brackets, 2mm stainless steel angle brackets, 3mm aluminium chassis components etc. please give us a call on 01489 577786 and we will be happy to chat through your idea with you. Or perhaps you have a drawing you want to send to sales@vandf.co.uk and our engineering team will be happy to review it and produce a range of price options for you. These aluminium chassis components are used in electrical test equipment and are typical of the sheet metal work that we manufacture for many of our customers in the UK using CNC punching and CNC bending equipment. This batch of 25 components were then sent out to be Iridite NCP treated and then black spatter painted to our customers drawings. 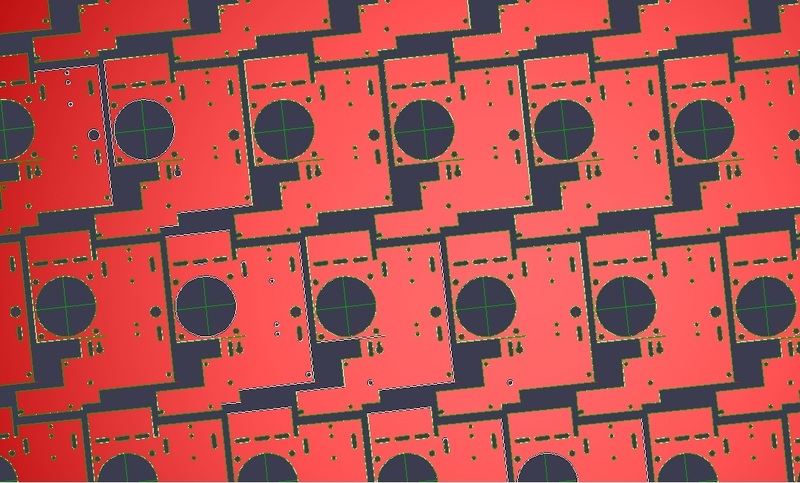 When you want to produce potentially 1000’s of holes quickly and accurately in sheet metal components the best solution is to use cluster tools. These CNC punch press tools are single tools with many individual punched and dies in set patterns. 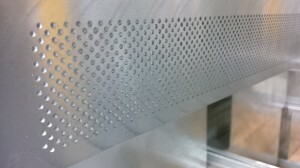 On our Trumpf 3000R CNC punch press we can punch approximately 75 holes per second with our most productive tools that were used to produce this vent pattern here. We can produce complex parts with laser cut profiles and cluster punched holes patterns as a hybrid between two machines when needed bring the best strengths of each machine to a single sheet metal component. Looking for aluminium profiles with curved shapes? With a laser cutting machine the curved profile can be easily created, such as these light fitting accessories where curves can blend perfectly back into straight lines. Not only is the profile clean but at this gauge there is no cutting burr on either side of the of the sheet metal. 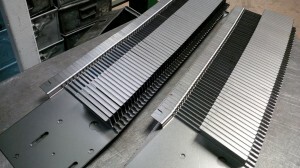 Each of these parts were approximately 200mm long and were cut in seconds with many being nested together from a standard 2500mm x 1250mm sheet of metal. These are just simple parts, some laser cut components that we cut here in Fareham Hampshire can be very complex. All the parts that we laser cut are programmed with our Radan 2016 sheet metal CAD/CAM software. Where you are looking for laser cut aluminium, stainless steel or mild steel components our Trumpf 3030 3KW laser produce your parts. And being a fibre laser cutting machine it can cope with copper and brass sheet right up to 6mm thick. If you have a drawing you want us to look at then please send it to sales@vandf.co.uk or give our engineering team a call on 01489 577786. Just because we use our two Trumpf 7036 CNC press brakes for bending small parts doesn’t mean they cannot help out when folding larger sections. Right up to 1M long is no problem for these great little machines and with 36 tons force they have more than enough force to fold up these zintec chassis sections. This image clearly shows the 1M tooling across the top and bottom of the press with plenty of room to access the machine for quick production bending speeds. 3D graphics and a touch sensitive screen allows the shop floor machine setters to write CNC programs really quickly, store them away on our company server and recall them for repeat batches of work whenever needed. These machines are a big part of what we do here at V and F Sheet Metal with the majority of our bending work being under 1M long but when parts are over 1M long we have our new Safan e-Brake 3M 100 ton machine to take over. This new machine can obviously bend items under 1M as well to offer a great bending service to our customers. Along with a 2.5M long CNC press brake and 2 smaller 600mm machines we have all sheet metal bending needs covered under one roof. The sheet metal blanks in this case have been manufactured by CNC punching but they could just as easily have been laser cut and they would have bent up just the same. Having the ability to provide the machine with accurate blanks batch after batch is vital to not only ensure the accuracy of the final folded parts but in enabling quick set up of the machine tools with minimal adjustments needed before production bending can start. Whether you have a sheet metal working project than is just a few mm across or up to 3M long we can help you here at V and F Sheet Metal, please give us a call at 0.1489 57786. So what is CNC punching? Here’s a perfect example of the flexibility in CNC punching that can be achieved when using a Trumpf machine. These aluminium housings and covers were CNC punched from the same sheet of material and used together to create an enclosure for a light fitting gear box. The ability to be able to mix and match components together on a single sheet of material is very useful when running production to keep batches together and ensure that the same material with bending properties is used on mating parts. Once the CNC press brakes have been set up to run a housing such as these they can go straight into the covers without a tooling change of more test samples needed for trying out the bend dimensions. If you look carefully you can see that the housing blanks share a common slit line in both the X and Y axis. This techniques helps us save time in CNC punching and materials across the whole sheet. You can also see that we have used a corner radius tool on the covers to the left of the photo to produce a clean R5 corner in a single hit and used a knife tool to produce the holding tag for the part in the CNC nest. Both the housing and the covers where simply shaken and they then fell out of the sheet with 0.1mm corners tags, a quick de-burr and they were ready for bending. 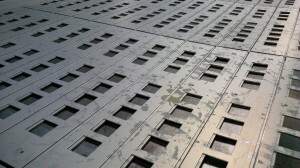 Looking for someone to manufacture your aluminium sheet metal work by either CNC punching or laser cutting? Please give us a call on 01489 577786 or send us you drawings (DXF, DWG, STEP, SAT or PDF) to sales@vandf.co.uk and we will be happy to help you and produce some prices for different batch sizes. Whenever we have a complex bracket or chassis component that needs multiple folds we tend to put it on our Trumpf 7036 CNC press brakes. If they are under 1M long these are the perfect machines to produce folded sheet metal work but if they are over 1M long such as structural sections, channels and angles then our Safan e-Brake 3M CNC press brake machine is just the thing to get the job done. With all machines using the same tooling it enables us to move parts under 1M long between all 3 machines enabling panic orders to be dealt with alongside repeat batch order bending work. As well as all the folds you can see here that have been bent into these sheet metal components with hard V top and bottom tooling there are also a line of obround slots that have been laser cut into the component which will be used as an “easy bend” line, therefore a deliberate weak line that can be folded by hand rather than by machine tooling. In this instance we used the “easy bend” line to finish off bends on the chassis as the tooling couldn’t access the part with the other bends that were already in place. The idea of an “easy bend” can sometimes be used by the customer in their assembly of the parts if components have to be fixed in place first. If you have a sheet metal component that needs folding then please feel free to send us your drawings to sales@vandf.co.uk or call if you need some advice on 01489 577786. 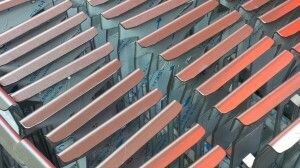 Laser cutting copper sheet metal has always been a problem for conventional CO2 laser cutting machines. With a fibre laser cutter this isn’t a problem and we have just the machine to deal with copper and brass up to 6mm thick. 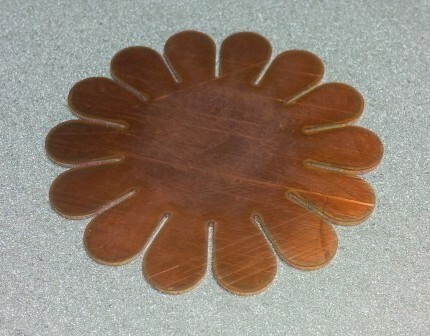 Our Trumpf 3030 3KW fibre laser is more than able to cut straight through thin copper sheet such as this flower. 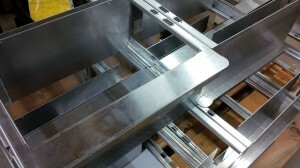 For this sheet metal project our customer needed a quick turn around. We quoted for the work, programmed it, laser cut it and sent it out in 2 days, more than meeting our customer’s expectations. The “flower” was a blank for some jewellery project and we defined the shape in Radan sheet metal software and fed a drawing back to our customer to match her simple hand sketch and verbal instructions. Now we have the design on our system server we can produce the copper “flower” again and again without any variance from batch to batch. 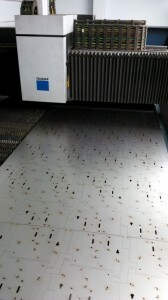 Perhaps you have a sheet metal manufacturing project which needs making from copper or brass sheet and haven’t been able to get it laser cut up to now, please give us a call on 01489 577786 and we will be happy to talk through your options and how we can save you money with our fibre laser cutting system. 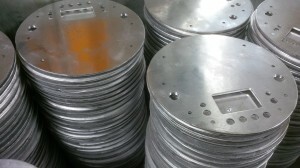 Yes we can produce circles, semi-circles, rings and large holes in sheet metal components with our fibre laser cutter. 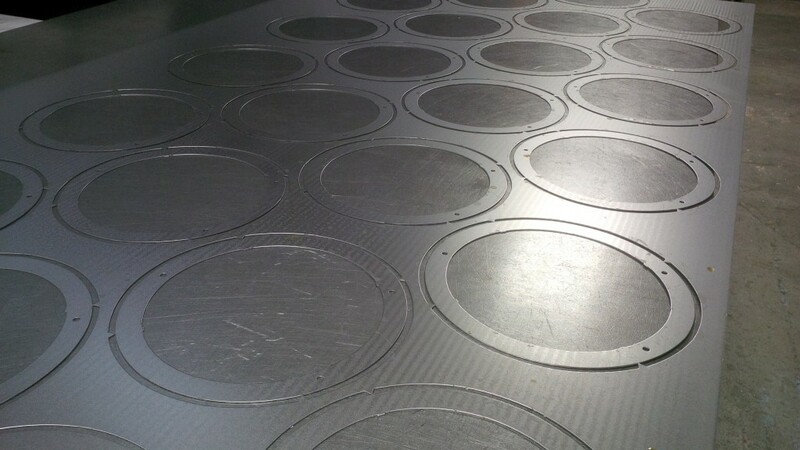 Sometimes it suits us to us one of our Trumpf CNC punch presses to produce the sheet metal circles. Using a CNC punching technique along with radii tools called “banana” tools the circles can be produce with just a few hits. Using these special tools enables us to produce parts with very few hits, saying time and money and also reducing the cleaning up time as a secondary operation. This view shows just how easy it is to layout a sheet of circular components using Radan sheet metal programming software. The components can be laid out to produce the maximum number of parts per sheet and even punching between the machine clamps on the sheet. Perhaps you have a sheet metal project that needs a large circular cut-out or a disc / ring as show here. Please give us a call and we will be happy to see what we can to do to either CNC punch or laser cut the shapes you want in either ferrous or non-ferrous material in a range of thicknesses.